Sculptor Mason Jackson has come to the manor to make a final, all-or-nothing attempt at success before giving up his dreams. When he becomes obsessed with carving Ephram Korban’s form out of wood, he is swept into a destructive frenzy that even Anna can’t pull him from. 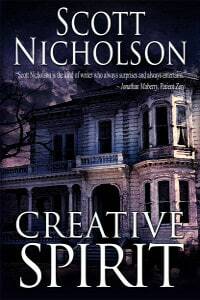 CREATIVE SPIRIT is Scott Nicholson’s revised edition of the 2004 U.S. paperback THE MANOR. Scott is Kindle bestselling author of 12 novels, including THE RED CHURCH, DISINTEGRATION, LIQUID FEAR, and SPEED DATING WITH THE DEAD. Connect with Scott on Facebook, Goodreads, LibraryThing, Twitter, blogspot, website or Amazon page.